‘Tis the Season: Sleigh the Holidays with the Latest Game Update! The Fiends are telling you why. A new game update is coming to town! Merrymaker Moose is spreading holiday cheer and getting gifts for all the Fiends. Complete all 15 tasks, and you’ll get to keep Merrymaker Moose and his +50 power boost as a special gift! New Fiends are coming to town! 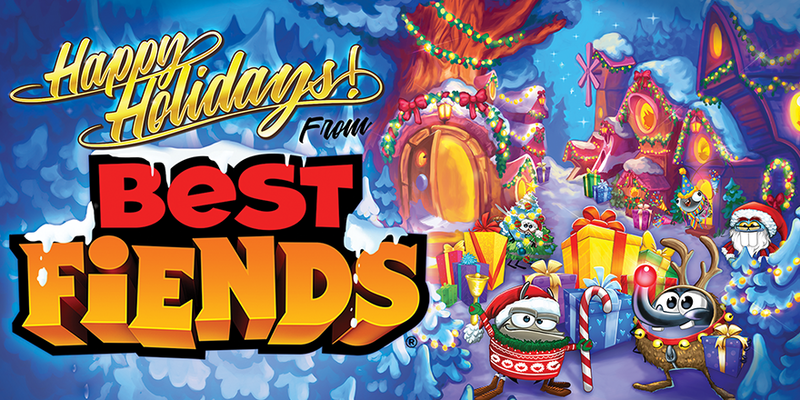 Welcome Ru to the Best Fiends family just in time for the holidays! She brings her all-new Fiend power: the Dual Mega Blast! Calling all party animals: prep for the New Year’s Eve party by gathering Party Hats and plenty of rewards along the way! Collect all the Party Hats, and you’ll win Party Animal Freddie and his +50 power boost! Begin your treacherous trek up Remote Ridges with 20 new levels every weekend! Plus, you can play ten bonus levels on New Year’s Eve! On Christmas Eve, you can enter 10 new levels in Nocturnal Hills! And be sure to look out for 10 new levels on Christmas and 10 more the following day. This holiday update is more “lit” than your Christmas tree! Download Best Fiends or update your app now for FREE! And from the whole team at Seriously, happy holidays!